This luxurious, Air Conditioned, 2 bedroom penthouse apartment is located in Torreblanca, Fuengirola on the Costa del Sol, just 20 minutes drive from Malaga airport. The fully air conditioned accommodation boasts two double bedrooms, two full sized bathrooms (one en-suite), a fully fitted kitchen, a large comfortable lounge/diner, a south-west facing sun terrace, and a spiral staircase leading to a full size patio/sundeck on the roof, affording the benefit of sunshine all day long. The apartment complex is 15 minutes walk from the beach and just 5 minutes drive from the towns centres of Fuengirola and Benalmadena. 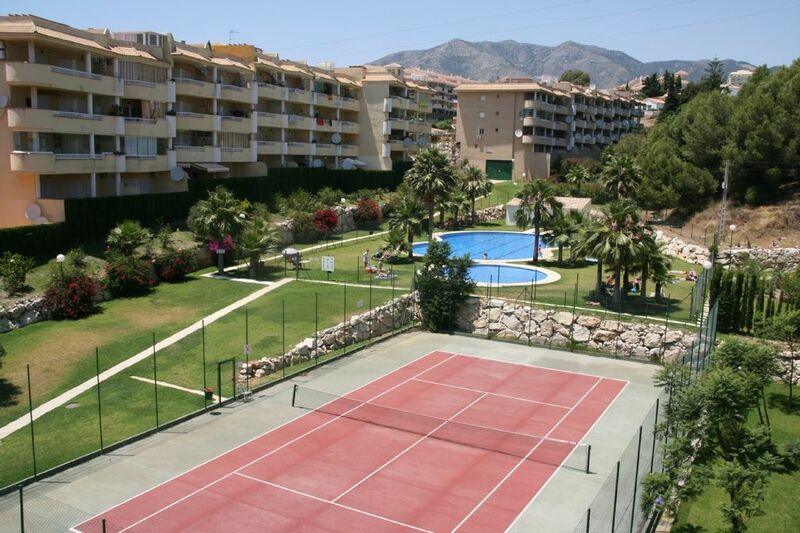 There are two communal pools (summer season only), two tennis courts and a children's play area within the complex. There are nearly 50 golf courses within an hours drive. Gibraltar, the gateway to Africa, is just 50 minutes away on the motorway. For more information please get in touch. We have been using this apartment as our holiday home for many years, but rent it out to help with it's payment and upkeep. The South coast of Spain is so conveniently located for flights from the UK, it's the ideal destination for some (usually) guaranteed sunshine without a long haul flight. One bathroom is ensuite to the Master Bedroom. Both bathrooms have showers, bidets and full baths. No tumble dryer but clotheslines on roof sun terrace and folding clothes drying frame in apartment for use on balcony. Free fast broadband via a wireless router in the living room. SKY Satellite TV has been discontinued to the region due to changes in the satellites. Pay as you Go TV (UK Channels) is available if requested at current rates, typically £15/week. Contact owner. Sierra Nevada Ski resort about 2 hours drive. Tennis raquets and balls are stored in the second bedroom wardrobe. Many Golf courses in the Costa area. There is no smoking in the apartment. The owners request smoking be confined to the balcony and the roof sun terrace. Pools open summer season only. Telephone usage will be deducted from deposit. The electricity is supplied through a coin meter which takes 2€ coins. The apartment lights and fridge/freezer are not controlled by the meter and are always on. Car parking for 1 car in locked ground floor garage. You may use the phone in the apartment, but any excessive call charges during your stay will be deducted from your deposit. Local and international charges are similar to BT tariffs. Electronic safe. The property was excellent. Everything you could need is there. Spacious, clean and modern. 10 mins walk to a nice beach and a few bars. 50 minute walk to centre of Fuengorila or catch a bus at bottom of hill. Train stations 15 mins walk from apartment. We have stayed in this apartment a number of times, it is situated on a complex which has a nice swimming pool and secure parking, the beach is also within a short walk. There is a good sized living room with a DVD player and a kitchen with fridge . washing machine / oven / microwave. This is an ideal apartment for a group of friends / family as there are facilities within the complex and also you are near to the beach, shops and train station. We had a lovely stay, the apartment was very comfortable and well equipped a lovely home from home, the owner Nigel was very helpful and provide good information before and within the appartment , 10 minute walk from the beach which was clean and not crowde. The food was mainly good and very reasonable, public transport was frequent and cheap. Highly recommend!! Casa Deana is a wonderful place to stay when visiting Spain!!! Coming from California, USA, we were genuinely pleased with our luxury accomodations. The location was perfect and the vistas from the balcony offered incredible views. My family and I were pleasently surprised at how quiet and peaceful the complex was during our stay. Many owners looked like retirees enjoying life in Spain. The property was very clean and well-maintained. (I just loved the quality of construction and the various hardware used. I wish we had similar items here in the US.) It was a very comfortable place to be; close to downtown Fuengirola and the beaches. Our experience was greatly enhanced by the wonderful way the owners kept us informed and arranged to ensure that our holiday was pleasent. I would most definitely recommend this property!!! Caveat: if getting a "Car Hire", get a relatively small vehicle...at first, parking was a challenge because of the location (of the wall), but, after a few days I became quite adept at backing into the parking stall...but, the parking stall was quite conveniently located near the "lift"! Also, have your house keys readily separate from your car keys, so, that you can activate the garage opener key!!! And for those not familiar with the trash arrangements, items are separated and deposited into corresponding receptacles near the garage entrance...Organics, paper, glass, etc. I found it fascinating on how they were collected, which happened almost every morning. The balcony actually gives you a "birds eye view" on how it occurs. Cheers!!!! And a special thank you to the Dean's for your graciousness and hospitality!!! The apartment is really spacious, altough we have spent most of our time either on the good sized balcony or on the rooftop terrace which is suitable not only for sunbathing, but also features a barbecue grill. The beach is not far, we could reach it within 15 minutes on foot with a 7- and 10-year old. We also used the tennis court and the pool almost every day. There is a life guard by the pool, so it was not a problem to let the children enjoy the water while we were relaxing by the pool. The apartment is located in a very quiet residental area. The only downside of this is that the bigger supermarkets are not within walking distance, but we have easily solved this by taking a taxi. Nigel was very responsive all along the way, answered my questions instantly. I can recommand this apartment to anyone who prefers a quite neigbourhood, altough if walking 15 minutes uphill from the beach seems to be frightening, then a car is really recommended. Lovely apartment, great size with lovely marble floors. Excellent location. Great pool and tennis courts, gardens maintained to a very high standard. Owner Nigel was always quick to respond to e mails and provided lots of useful information. Enjoyed the restaurants in Los Boliches and Fuengorola, prices are on a par with what you pay in the UK. Torreblanca del Sol, on the glorious Costa del Sol, is situated between the coastal towns of Fuengirola and Benalmadena. It is on the seafront and has it's own beaches, bars, cafes and shops. The location is ideal for visiting the historic cities of Seville, Granada, Ronda and Cordoba. Skiing in the Sierra Nevada mountains is 90 minutes drive. Malaga is a bustling port city which has a castle with a fabulous view and Marbella, home of the rich and famous, is also worth a visit.